Billings Boats BIL520 Slo-Mo-Shun 4 1/12 scale wood ship kit! When three men met in early 1949 at a Seattle sailboat shop, none of them could have foreseen the peculiar and far-reaching consequences of their joint venture to build a better race boat. 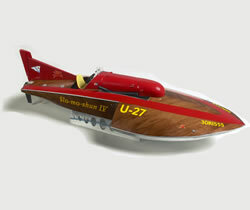 Slo-mo-shun IV was indeed better than any previous race boat. But she was more than that: Slo-mo IV touched the hearts of thousands who cheered her on and changed forever the way generations of Seattleites felt about raceboats. Slo-mo-Shun IV transformed the lives of those most closely associated with her, nearly destroying some of them.